Our neighbor has a fig tree, and a few branches hang over our fence. Today some friends came over to pick figs from our side of the fence, and it was discovered that figs dried on the tree (like this one) taste like Fig Newtons. so if you ate them with a little cookie you would have it made, right? 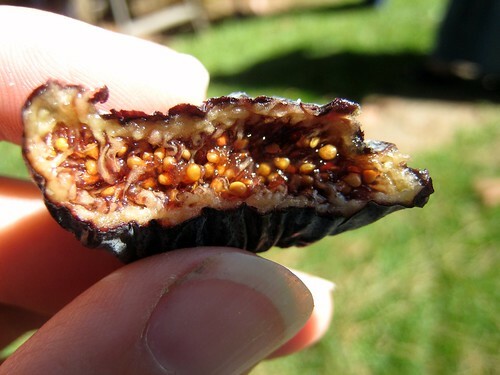 Figs are awesome – except for all the flies they attract. Ever since Tableau Vivante turned me on to figs, I’ve been eating them every day. How great that you have such easy access to them!! We have a volunteer fig tree that showed up a few years ago. I generally only eat the figs frozen (they seem to seedy/squishy fresh, but they taste great frozen). Though I do love fig newtons – I’ve just never thought of trying the ones that dried on the tree. I might just be able work up the courage now that you’ve recommended them. Wow, right off the tree. I’m with Anne, it looks pretty gross. But I’m the biggest Fig Newton junkie out there. Figs in some dishes in great restaurants have been some of my favorites in the last year.